They remain one of the world's most beloved bands, an eclectic blend of Englishmen and Americans called Fleetwood Mac. This spring they will hit the road once again, embarking on a significant North American tour that will run until late summer. They also have just released an expanded version of their magnum opus, 1977's Rumours. The sprawling edition goes way beyond the basic album, which since its release has sold over 40 million copies worldwide. The only group composition on an album made by self-obsessed individuals, it is The Chain that best articulates Fleetwood Mac's situation at the time - its three discrete elements articulating the band's estrangement from one another. As you can hear over the course of this set, one part comes from a rather sleepy Nicks song called The Chain. The concluding guitar blowout comes from an outro to a McVie composition called Keep Me There. The verse comes from a reworked old song by Buckingham. It's not called The Chain because of some cosmic understanding between band members. It's called The Chain because it comprises three utterly separate elements that have been pragmatically stuck together by Lindsey Buckingham. Hence, one presumes, his exasperated swearing on the lead-in. Time has made it an anthem, but the expedient composition of the song reveals an important truth about the pragmatism at the heart of Fleetwood Mac. Once a stalwart hard rock band, necessity had forced them to change so often that by the time they arrived at the line-up that made Rumours, the band were in their third distinct phase. Fronted by the mercurial Peter Green, at the end of the 1960s the band had enjoyed chart success with an eerie and lyrical take on the blues. When Green left, mellower songs were written to diminishing commercial returns by another guitarist, Bob Welch. When Welch departed, Mick Fleetwood (the drummer for and sergeant major of the band) doggedly searched again for new musicians. 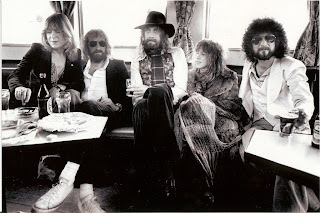 If you’re looking for full-on drink and drugs debauchery, celebrity psychosis, überdysfunctional inter-band relationships, lashings of money and ego, and extremities of fear and loathing, you have to look past the usual suspects (Zeppelin, Mötley Crüe et al) and steady your gaze on Fleetwood Mac. Going into the recording of Rumours – still one of the bestselling albums of all time – things weren’t pretty. Bass player John McVie and keyboardist Christine McVie had just divorced and weren’t on speaking terms. Singer Stevie Nicks and guitarist Lindsey Buckingham were in the middle of breaking up but still on speaking terms – if shouting at each other in ferocious rage counts as speaking terms. Drummer Mick Fleetwood had just got divorced, the group had just sacked their manager and their producer, and they were doing enough cocaine “to turn horses into unicorns” as the saying went. For good measure, Nicks and Mick embarked on a shortlived and very drunken affair. These five people – all of whom had been romantically/sexually engaged with another band member at some time – had to sit in a room together and come up with 11 songs for a record companyimposed deadline. The only other time this kind of situation had occurred with a major band was with Abba – and they used the adverse circumstances to record some of their biggest hits. As did the Mac. But just to give some idea of the level of tension, suspicion, hatred, insecurity and paranoia that prevailed at the songwriting sessions, Christine McVie brought a new song to the table called You Make Loving Fun. It was written about her new postdivorce boyfriend (who was also the band’s lighting director) and was seen as a personal attack on her erstwhile ex-husband. At around the same time, Mick Fleetwood started going out with Stevie Nicks’s best friend. The blizzard of cocaine was such that the band, seriously, wanted to give their dealer a credit on the album. The label demurred and a stand-off was only averted when said dealer was shot dead, allegedly by an organised crime gang. Given all that went on, Rumours should have been a mess. The songs were recorded in a small, wooden, windowless studio with the band arriving at 7pm each night, getting off their collective heads until the early hours and only putting down music and vocals when they were too whacked out to keep on partying. Yet it’s as close to a near perfect pop-rock artefact as you could ever hope to hear, and its appeal lies in the fact that we are listening in to love breaking down. How did the band manage to stay together to finish the album? Stevie Nicks now recalls it was a case of “I’m not the problem, I’m not quitting. You’re the problem, you should quit.” With no one prepared to give in, they effectively stayed together out of spite. Rumours is 35 years old now and there’s a special commemorative, expanded edition of the album just released. Pure music reality TV. Fleetwood Mac 35th Anniversary Expanded and Super Deluxe Editions Available Now. In this 2013 reissue, on vinyl, Go Your Own Way is 2 seconds longer ar 3:40 while on cd it is 3:38, and Songbird is 2 seconds shorter at 3:18 on vinyl but is 3:20 on the cd. Also the vinyl has a '2009' date while the other packaging notates '2013'-- i hope the extra long GDW is something i don't have, but maybe it is the same versionn as is on 'The Chain' box set. It's all a mystery to me- shouldn't the times of the songs be the same as in 1977? Makes it fun, and confusing. ^Sorry- i meant 4:51 not 4:41 on the old vinyl copy and first cd printing, re: GDW. Wow! If you notice seconds difference, you should get a life! Annonymous #2... Not necessary! I think it's interesting all the different lengths of tracks across the different versions. Whether there's actual music or lyrics sliced off or kept in, I'm not sure... But it is interesting... and hard to keep track of I'm sure if you are into that. I think it's interesting too about the time differences. I ordered mine and can't wait to give it a listen!